The Zawiercie web site was redesigned. The new version includes all the material that was presented in the older version with additional pages. The current history page includes new essays and references about the history of Kromolow and Zawiercie in general and in particular the history of the Jewish community. The web site is work in progress and we will be happy to receive photographs, stories and data of the Jewish life in Kromolow and Zawiercie. As regards the cemetery, Marcin Bergier was very busy this year clearing the vegetation and smaller trees as well as the area at the entrance behind the two buildings either side of the gate. He also contacted the city to empty the garbage can behind the carriage house. I have also sent him a chainsaw, which he plans on using next year to take down some of the smaller trees... One of the most difficult issue we are dealing with are the two buildings on either side of the entrance gate. The one on the left is the carriage house and the one on the right is where the caretaker lived and the bodies were prepared for burial. These two buildings have serious structural damage... If we don’t get some serious money, the two buildings will likely have to be torn down. If anyone has any idea about a charitable organization we can contact to get a grant, please let me know. Please forward this note to anyone I may have missed. "Dear Friends and Family, I would like to inform you that the city of Zawiercie is planning to commemorate the 70th Anniversary of the liquidation of the Zawiercie ghetto on Thursday, August 29, 2013. Attached, you will find the invitation and a preliminary program schedule. " "I attended the Zawiercie commemoration and found it to be a very worthwhile experience. I was particularly moved by the procession from the marketplace at the edge of the ghetto to the train station. In addition to town officials, there appeared to be a great many town residents who joined us as we walked about a mile on the route our family members were forced to take as they were being deported to Auschwitz. A large plaque commemorating the Jewish community was unveiled at the train station opposite the tracks in a solemn ceremony. This was followed by another ceremony at the Jewish cemetery. " 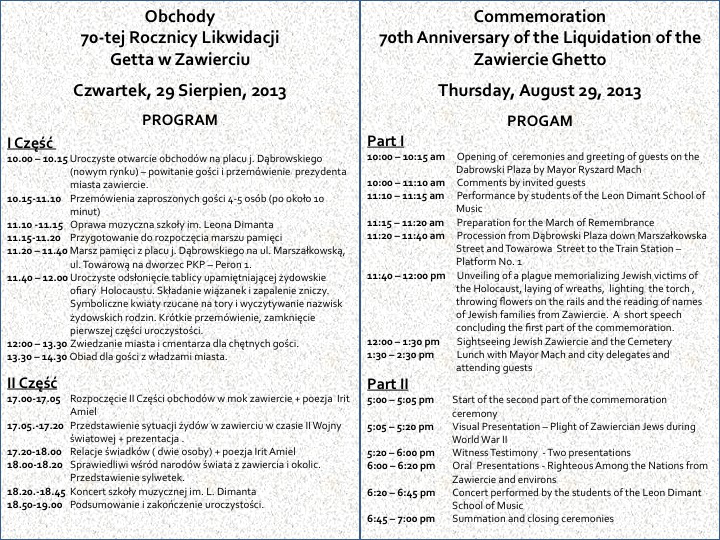 "Dear Friends and Family, I would like to inform you that the city of Zawiercie is planning to commemorate the 70th Anniversary of the liquidation of the Zawiercie ghetto on Thursday, August 29, 2013. Attached, you will find the invitation and a preliminary program schedule. "I attended the Zawiercie commemoration and found it to be a very worthwhile experience. I was particularly moved by the procession from the marketplace at the edge of the ghetto to the train station. In addition to town officials, there appeared to be a great many town residents who joined us as we walked about a mile on the route our family members were forced to take as they were being deported to Auschwitz. A large plaque commemorating the Jewish community was unveiled at the train station opposite the tracks in a solemn ceremony. This was followed by another ceremony at the Jewish cemetery." 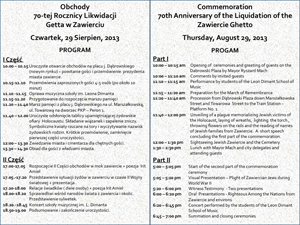 The program of 70th Anniversary of the Liquidation of the Zawiercie Ghetto. Jeff Cymbler wrote about the event for the newsletter of the Fraternal Order of Bendin- Sosnowicer in New York. 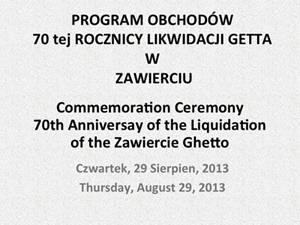 On August 29, 2013, the city of Zawiercie commemorated the 70th anniversary of the liquidation of the Zawiercie ghetto. Together with a group of survivors, led by Ariel Yahalomi (Diamant), and second and third generation survivors, I attended the full day’s events. “We meet today at a particular time, the 70th anniversary of the events that forever changed the face of our city – the city of Zawiercie, which together with its neighborhood which is today Kromolow, was for several centuries the home of our fellow citizens and neighbors – Jews.” In his speech, the mayor of Zawiercie, noted that Zawiercie’s growth and industrialization was largely thanks to the work of its Jewish neighbors and Jewish investors who like the Berliner banker Ginsberg believed in Zawiercie and contributed to its place in the world – the place where they lived together with their Polish neighbors. Mayor Mach stressed the importance of Zawiercie Jews for the economic and cultural development of the city. He noted that the destruction of the Jews during the German occupation was the most tragic piece of the city’s shared past. The city lost not only its 7,000 neighbors but also an important part of its cultural and economic identity. The mayor noted that during the war the Zawiercie Ghetto was one of the safest ghettos – although none of them was safe. It was to the Zawiercie Ghetto that Warsaw smuggled from its families at risk fighters of the Jewish Fighting Organization. But the moment came when Zawiercie said goodbye to its Jewish neighbors when they were loaded in the transports to Auschwitz death factory. At that point, in August 1943, a chapter in the history of our city ended – the Jewish heart stopped beating – said the president. As part of the ceremonial events, participants walked from the “new market square” of Zawiercie to the railway station from where the Jews of Zawiercie were sent to Auschwitz. There a plaque was unveiled commemorating the deportation and deaths of Zawiercie Jewry. 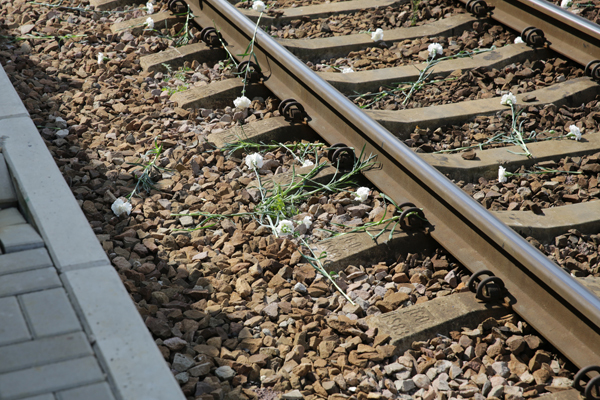 All participants were given flowers to sprinkle onto the railroad tracks in memory of those whom the Nazis deported in cattle cars to the death factories. After placing wreaths and lighting candles, ceremony participants drove to the cemetery in Zawiercie, where, at the mass grave of the murdered Jews, the Kadish was recited and the mayor laid a wreath of flowers. After lunch with city dignitaries, afternoon festivities continued at the Zawiercie Municipal Cultural center. Holocaust survivors spoke of their experiences during the war. Among them were Hedva Gil, a survivor who now lives in Israel and Dr. Danuta Zerykier Havel. A German soldier’s family hid Hedva after the Ghetto was liquidated. A Polish family hid Danuta, who still lives in Zawiercie. A Memorial Plaque at Zawiercie Train Station. In August 1942 (according to another source it was in May 1942) the Germans performed their first “Akzia” in the Zawiercie Ghetto. Members of the SS, members of the Gestapo and gendarmes with the help of Polish police officers expelled 2000 Jewish people from their homes. They rounded the Jews up in the center of the town, then led them to the train station, and transported them in over-crowded freight cars to Auschwitz. The people that participated in Zawiecie 70th Memorial on August 29, 2013, standing in Zawiercie Rail Station. 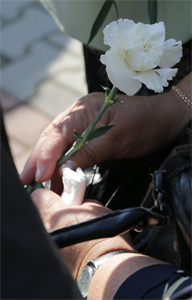 Zawiercie Rails with Flowers Spread by the People that Participated in Zawiercie 70th Memorial on August 2013. Copyright 2014.Ruth Wilnai. All Rights Reserved.